A unique Internet tradition and its great holiday is celebrated on February 3, Blogroll Amnesty Day, a day when we salute smaller blogs. 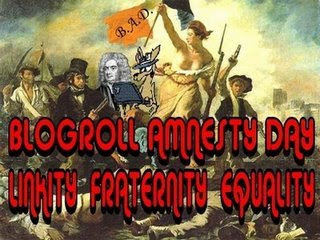 Blogroll Amnesty Day, or B.A.D., was not always such a happy day. 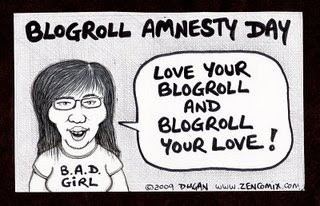 In fact, the first Blogroll Amnesty Day, way back in ought seven, was one of the darkest days in the blogosphere. Read here about that once terrible day which has been turned into a celebration and an annual tradition. Celebrating Blogroll Amnesty Day is easy. I've started with the MS Blogger Blogroll. What you can do is copy/paste this post (including the links!!!) and post it on your own blog. If you do something special to celebrate, like ZenComix who has drawn a cartoon, please let me know. You can also let the originator of the tradition know what you are doing to celebrate by emailing Jon or Skippy. ms not just a diary. When it is raining cats and dogs!!! Thank you for celebrating with me spreading some Linky Love!! OOOps! Ya missed me. Disabled Not Dead. Please insert? Glad to spread the link love. COBRA Subsidies: Do You Qualify? Do You Have MS? Do You Live Near Boston?